The Archbishop of Yekaterinburg and Verkhotury in Russia’s Urals has allowed the parish of his province to pray to icons that they download from the Internet, Interfax news agency reported. In Eastern Orthodoxy the icon is generally a flat panel painting depicting a holy being or object such as Jesus, Mary, saints, angels, or the cross. Icons may also be cast in metal, carved in stone, embroidered on cloth, done in a mosaic work, printed on paper or metal or other surfaces. 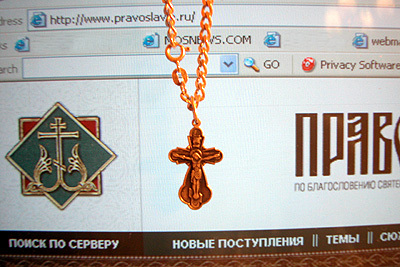 An icon is an indispensable item for every Orthodox Christian’s home. Some people even place them in their cars believing that their patron saint will protect them from car crashes. People in the region are now allowed to find the image of Christ or the saints they like on the Internet, download it, frame it, consecrate it to God in a church and pray to it. The Word of God strictly forbids the worshipping of images, idols, and icons. An "icon" is a "visual representation of an object" (such as an idol). God forbids us from worshipping such objects. In fact, God forbids us from even BOWING to them (Exodus 20:3-5). In an attempt to hide their evil idolatries, the Catholic Church has removed the second commandment from their official catechisms. Then they split the ninth commandment into two to make up for the lost second commandment. The FACT that the Catholic Church has butchered the Word of God is clear evidence against them that they know what they are doing. They are guilty of leading the masses of this world into wicked idolatry. Now they're even promoting internet idolatry. In Acts 18:13, we read that it was against the law to worship God freely. The law specified certain guidelines which outlined what type of worship was permissible. It was against the law in Paul's day to teach that Jesus Christ was the ONLY way to Heaven. Paul's preaching was turning lost sinners to Jesus Christ. They were forsaking their idols (and costing the idol makers lots of money). They wanted to rip Paul to shreds. The other believers had to protect Paul from the angry mob (Acts 19:28-30). This type of hatred exists today throughout the world towards born again Christians, especially towards those Christians who are speaking the truth as Paul did. The end-time religion will be a universal religion where everyone has their own god, their own "light" to follow. This type of Devilish New Age mentality is prevalent throughout America and the world nowadays. For anyone to teach that Jesus is the ONLY way to Heaven is increasingly being looked down upon as hateful bigotry by society. Laws have already been passed in Canada outlawing hate speech (such as preaching against the evils of homosexuality). A pastor in Sweden was recently sentenced to prison for preaching against homosexuality. The Bible proclaims uncompromisingly that there is ONLY ONE WAY to God the Father, and that is through Jesus Christ (John 14:6). Idol worship cannot save you, nor does it please God in the least. In fact, God HATES idol worship. "Ye shall make you no idols nor graven image, neither rear you up a standing image, neither shall ye set up any image of stone in your land, to bow down unto it: for I am the LORD your God" (Leviticus 26:1). It's also interesting to notice that the Bible links homosexuality with idol worship, "And he took away the sodomites out of the land, and removed all the idols that his fathers had made," 1st Kings 15:12. Don't you see friend, idol (icon) worship is religion without God... beliefs without morality... Churchianity without Christianity. Accepting Different Religions | It Pains Me | Catholic Blasphemy! Pope Commits Idolatry | Why Catholicism is So Popular? 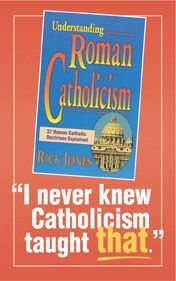 Roman Catholicism Exposed! | To Whom Do Catholics Pray?